I thought it might be fun to participate in the Weekly Photo Challenge since the theme this week is one of my specialties! 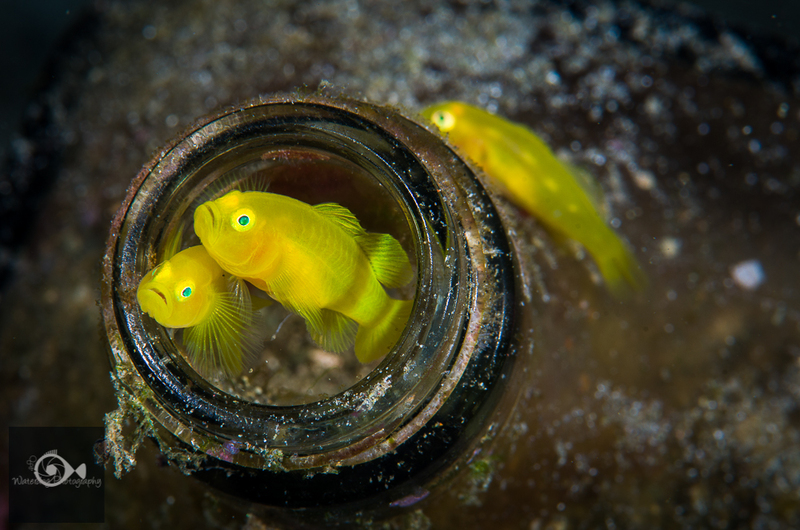 These yellow coral gobies make their home inside an empty beer bottle. 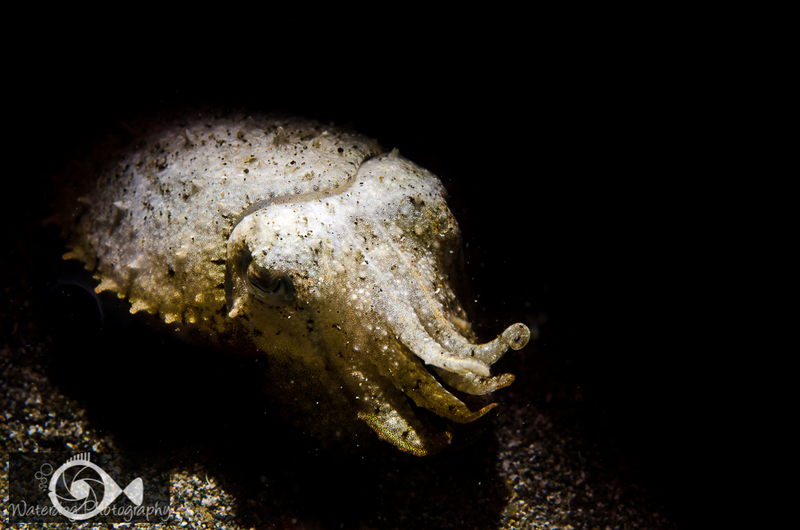 Of all the interesting creatures in the sea, the cuttlefish has to be one of the most unusual. Though it bears the name “fish,” it isn’t a fish at all, but a cephalopod, which includes creatures such as octopus, squid, and nautiluses. The Cuttlefish wears its shell on the inside and is called a cuttlebone. This bone is used to help keep the cuttlefish neutrally bouyant. Many bird owners buy cuttlefish bones at pet supply stores for their birds to sharpen their beaks on. 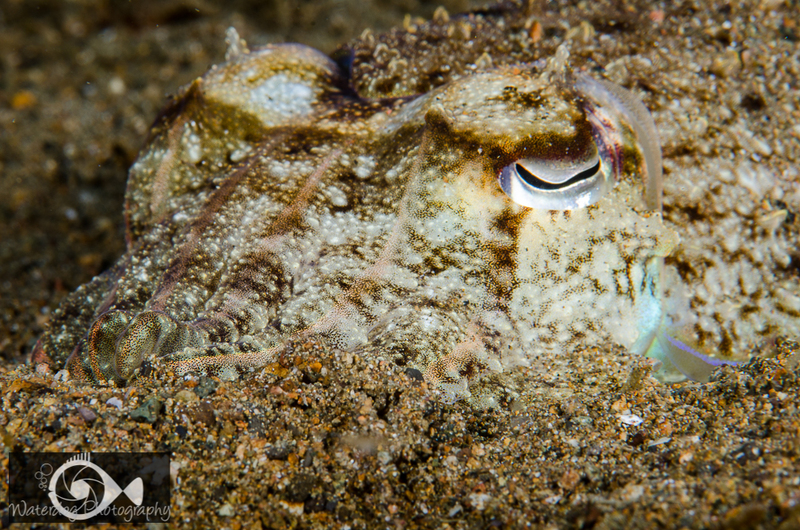 One of the remarkable things about cuttlefish, is their ability to blend in. 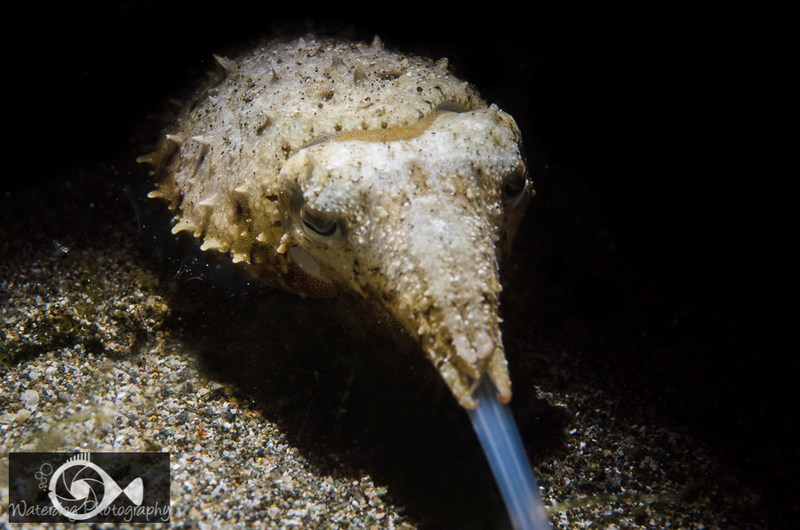 This cuttlefish has taken on the coloring and texture of the sand in which it has half buried itself. 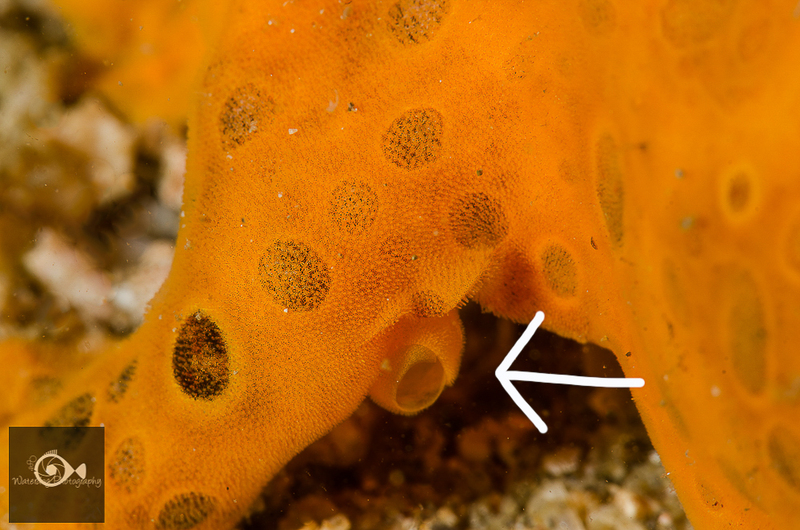 This little guy is a fraction of the size of the cuttlefish in the above picture. No bigger than my thumb, it also takes on the color and texture of its surroundings. One of the amazing things about this Cephalopod, is watching it feed. It has a very long “tongue” that slowly protrudes from it’s mouth until it is a fraction of an inch from it’s pray, then it quickly grabs it’s food and reels it in, in the blink of an eye. The male and female pair below are courting. 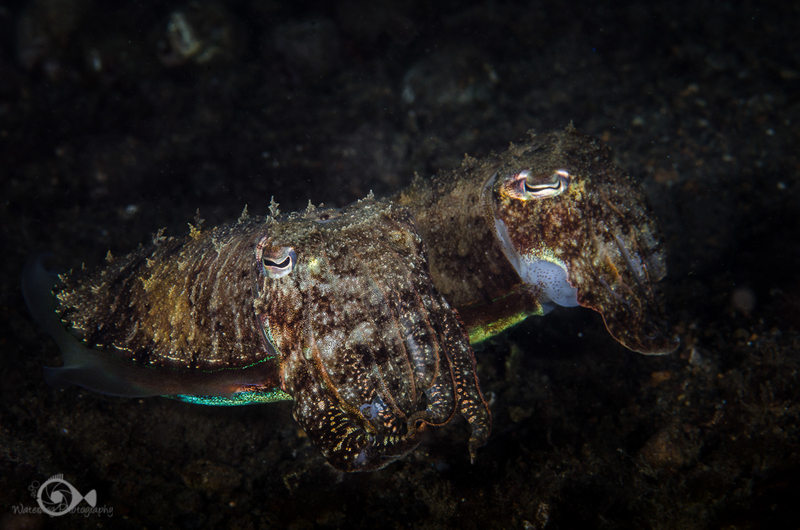 A male cuttlefish has four pairs of tentacles, while a female has three. Sometimes younger or weaker males may try to hide one of their pairs of tentacles by tucking them in so that they can approach a female unnoticed by other dominant males. 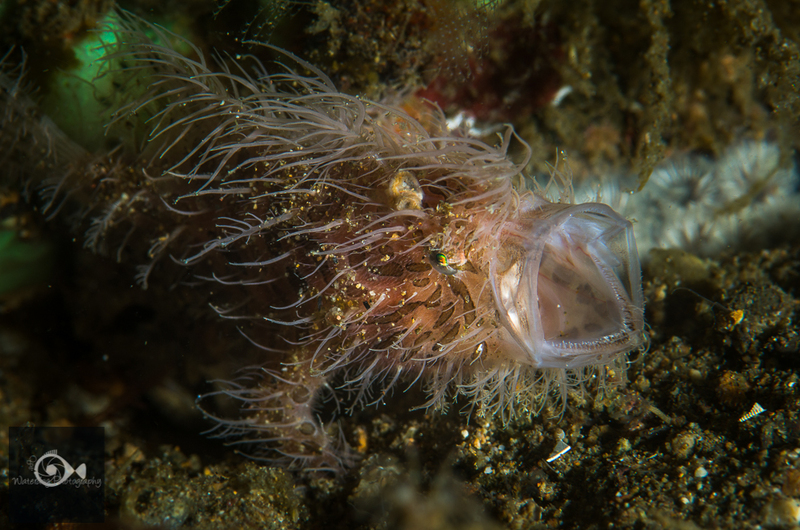 When they mate, the male places a sperm sack inside the mouth of the female with one of his tentacles. She saves it until she is ready to fertilize her eggs. 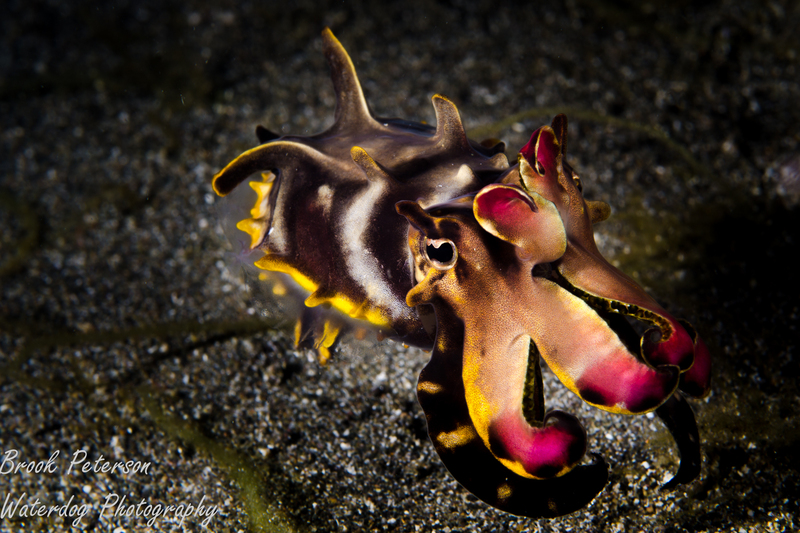 One of the most exciting cuttlefish is the Flamboyant cuttlefish. This one doesn’t try to blend in at all. On the contrary, they are as colorful as can be, hence their appropriate name. Sometimes their colors will undulate so that it looks like its white stripe is moving down its body. They often hold up the two front tentacles in a “boxing” stance if they are feeling threatened. 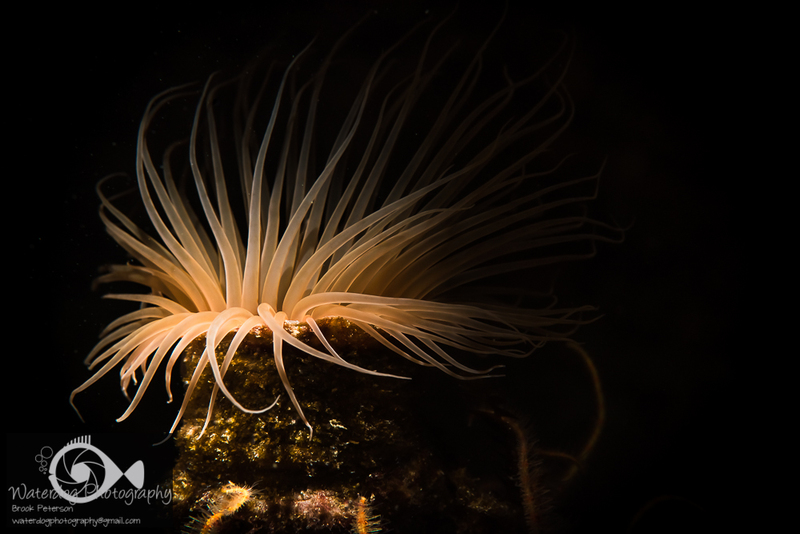 These photographs are taken with a Nikon D810 in Sea and Sea Housing using two YS-D1 Strobes. 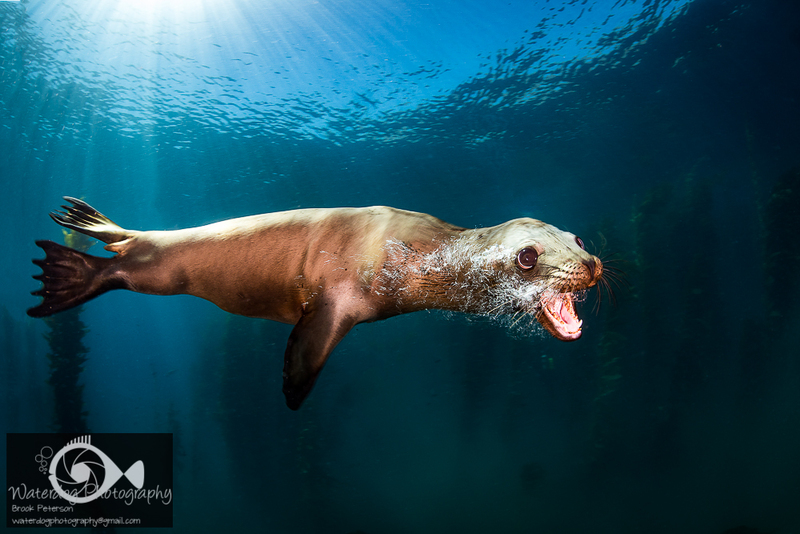 A great underwater action shot can be the most challenging objective a photographer faces. Not only does it require that the photographer be thoroughly prepared, but patience and a fair amount of luck are involved as well. Perhaps the easiest of these requirements is being prepared. The image above is what we call a “grab shot.” A fast moving animal swims by, and you quickly grab an image and hope for the best. Or do you? 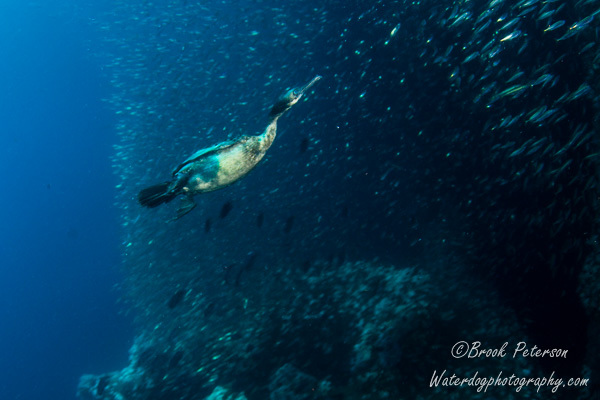 This image was taken at the end of my dive as I was completing my safety stop. Previous to this shot, I had been shooting images with a sun-ball and so had my aperture stopped down and shutter speed high. Before I started my ascent, I changed my camera settings to f/8 and 1/125th just in case something came by. The key here, is that I prepared ahead of time for the possibility of a grab shot. I had seen some sea lions playing near the surface, and I hoped I would be able to get an action shot of them. Being prepared means that you are aware of what the possibilities are, and before you move on looking for your next subject, you set up your camera for the possibility. A good rule of thumb to remember is “f/8 and be there,” and a shutter speed matching the conditions (i.e. With our without strobes? Close to the surface or deeper?) In this case, I used ambient light, and so had my shutter speed down a little. 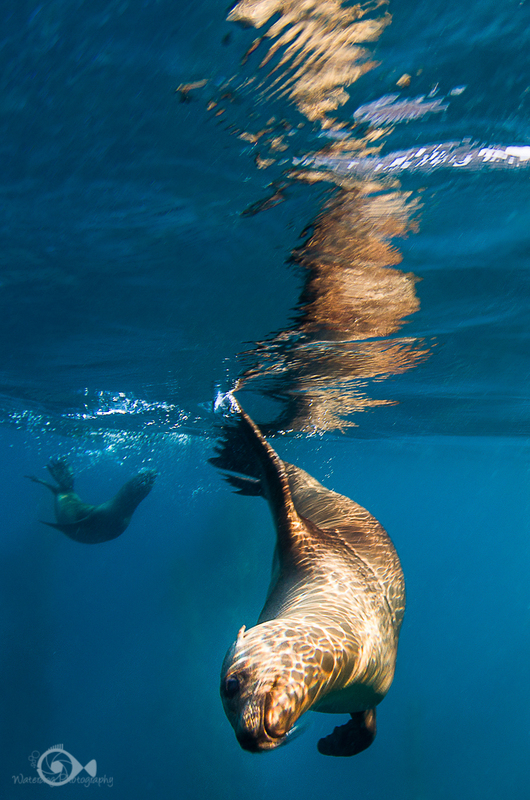 I could have used a faster shutter speed to freeze the action, but that would have required strobes, and I would not have achieved the great reflections of the sun on the sea lion’s body. 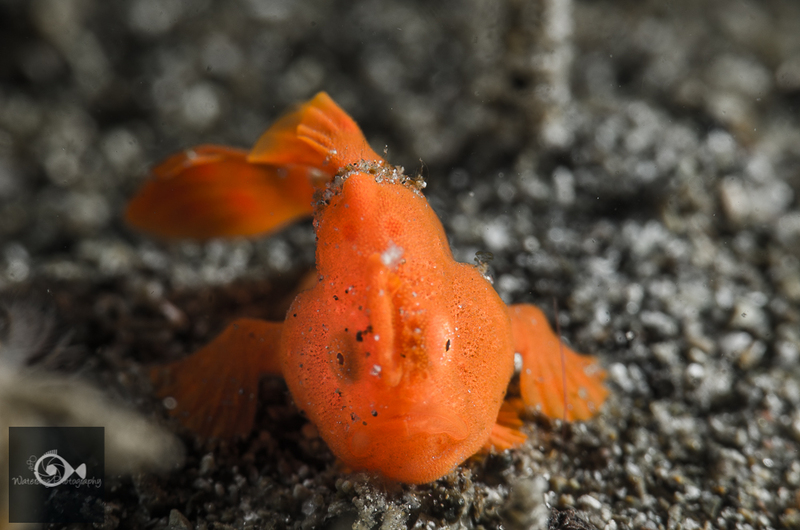 It’s great to get a frog fish yawning, but knowing when the mouth will be open at its widest is the key to getting a “peak of the action” shot here. Spend a bit of time observing your subject if it is something that will hang around for a while. 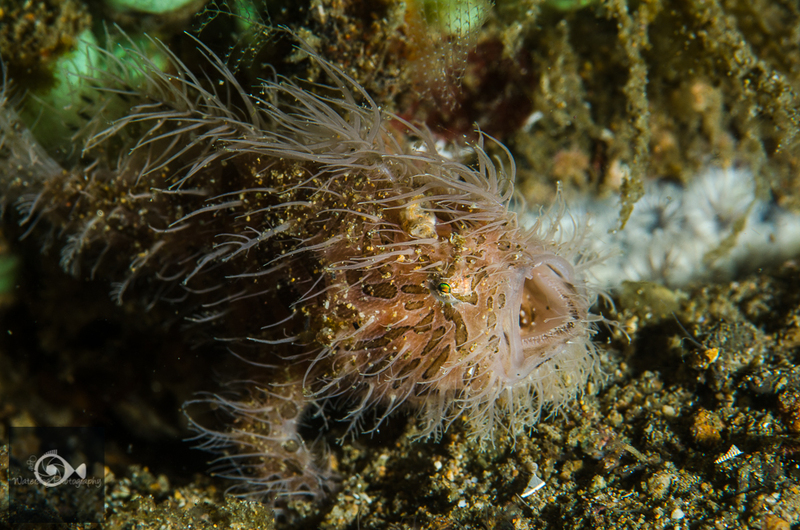 This frog fish yawned several times during the thirty minutes or so that I spent with it. It took a lot of patience and a lot of shots to get a keeper. #3 What Does Luck Have To Do With It? Luck may have less to do with it than you think. And yet, it is a factor. You can increase your chances of being lucky by being prepared, and increase them even more by studying your subjects. 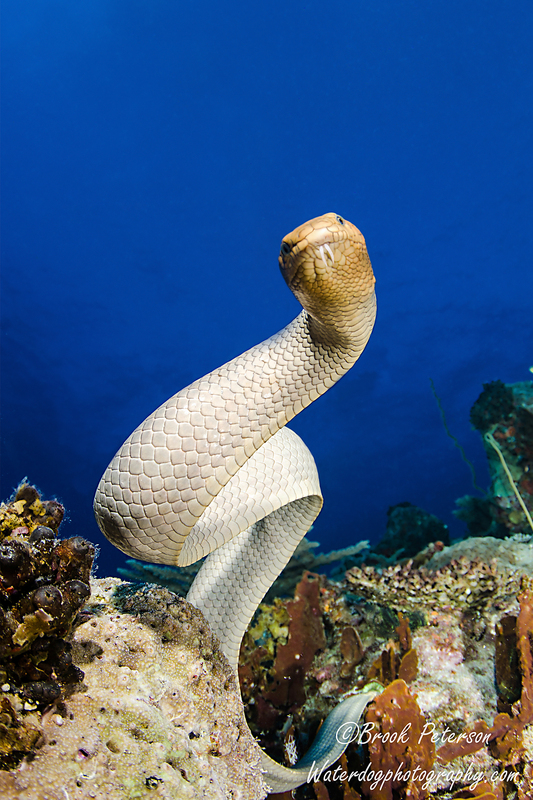 Many subjects will hang around for a while or may even live permanently in a specific place or area of a reef. 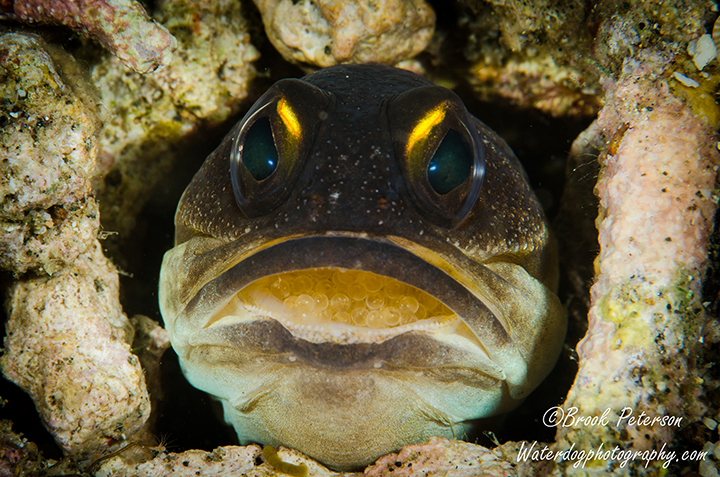 If you want to get an image of a cardinal fish with a mouth full of eggs, for example, take the time to study the fish. Find out which ones are carrying eggs and what their habits are. Watch them and see how often they aerate the eggs and what the signs are that they are about to spit them out, or move them around. 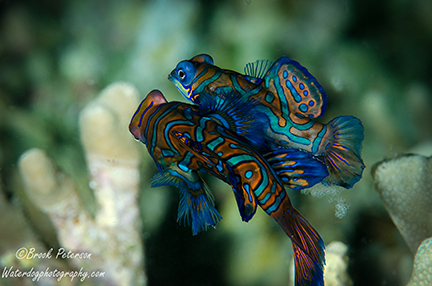 These Mandarin fish mate at dusk in a predictable pattern. The only bit of “luck” needed here was snapping the shot the moment the eggs were released. 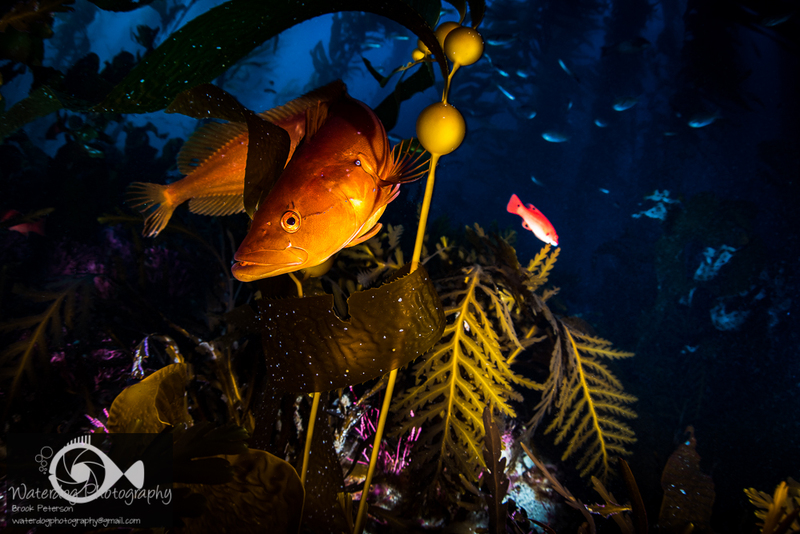 If you have suggestions for underwater photography tips, or questions, please feel free to leave comments below. As always, if you enjoy my images please visit my website, waterdogphotography.com, or give me a like on facebook at Waterdog Photography Brook Peterson. 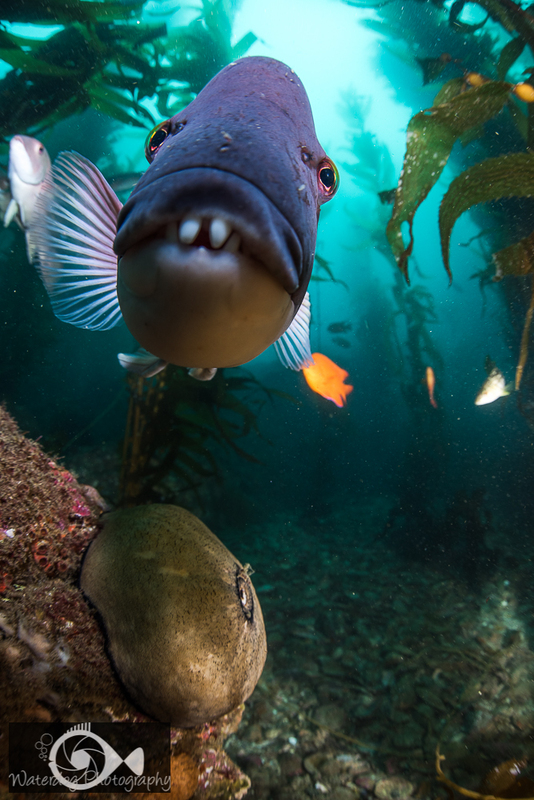 One of the challenging things as an underwater photographer is getting your subjects to face the camera. 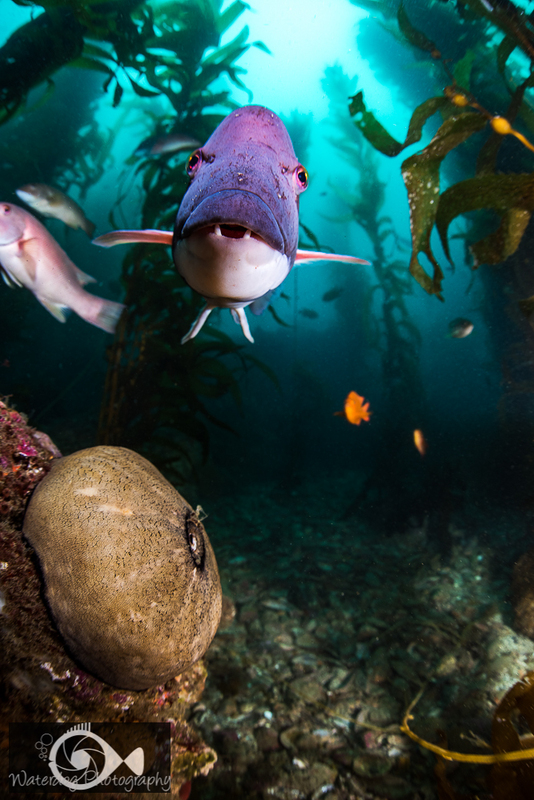 Marine critters are inexplicably camera shy! Most likely, it is because of the bright focus light you are shining in their face, but it could also be that your dome port looks like a big eye and that can freak out any little beasty. 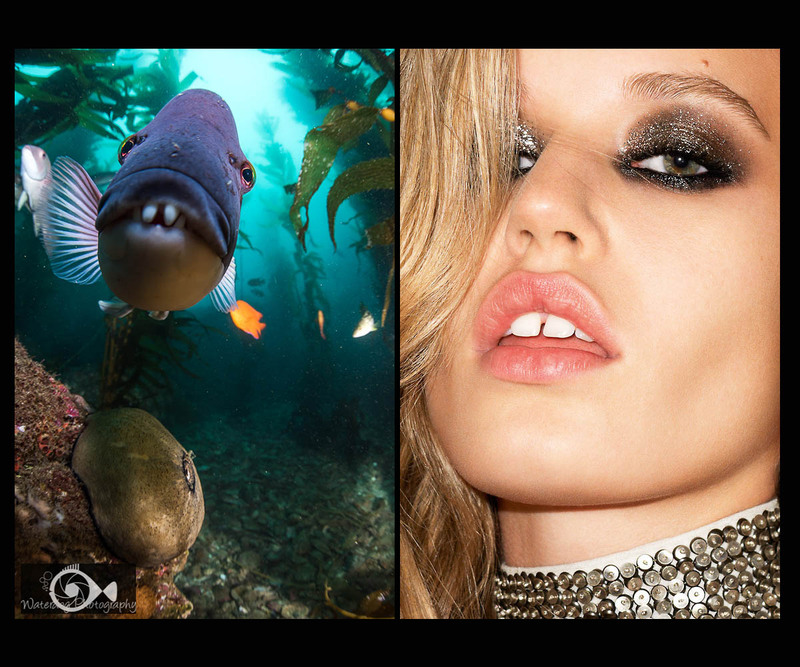 Luckily for photographers, there are some tricks we can try, and common sense we can apply. 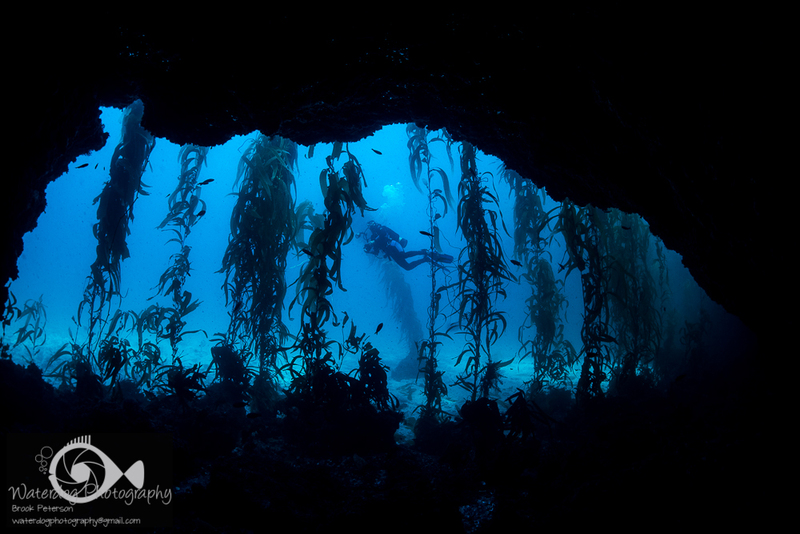 Underwater camera gear manufacturers are aware of the lighting issues photographers face. On one hand, we must have enough light that our camera can focus on the subject and the thing we want in focus the most is our subject’s eye. On the other hand, shining a bright light in our subjects eyes causes it to turn away before we can get the shot. The solution to this is a red focus light. 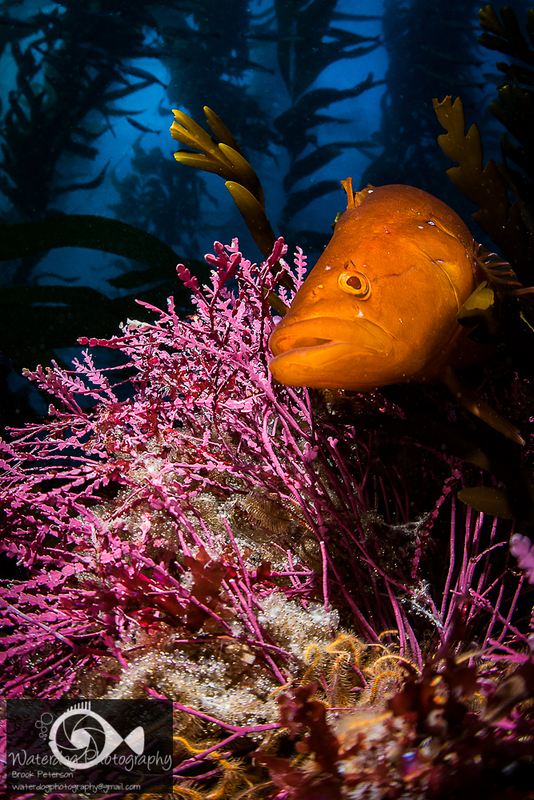 Several lights on the market have a switch that will turn the light red, a color that is theoretically not seen by marine animals. The following image is a good example of critters that don’t tolerate light well. 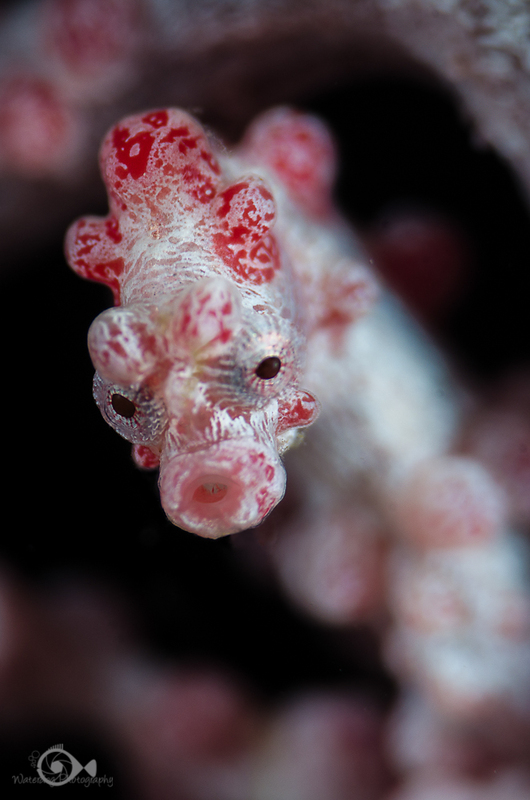 The pygmy sea horse has no eyelids and cannot shut it’s eyes. Because it is so small, it is a challenge to focus on, even with good light, and the moment you get it in focus, it turns away. Trick #2: Fake them out! 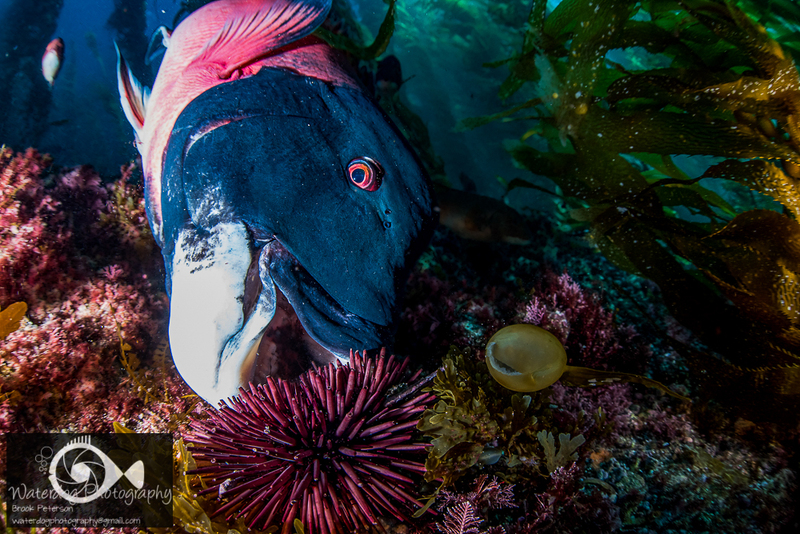 Another trick to help turn a camera shy critter toward the lens is to hand hold the focus light behind the animal, or have your dive buddy hold the light so that it faces the camera. The animal will turn away from the light, toward the camera. There will be enough light for the camera to focus, and walla! Sometimes you just have to wait for the critter to get used to you. 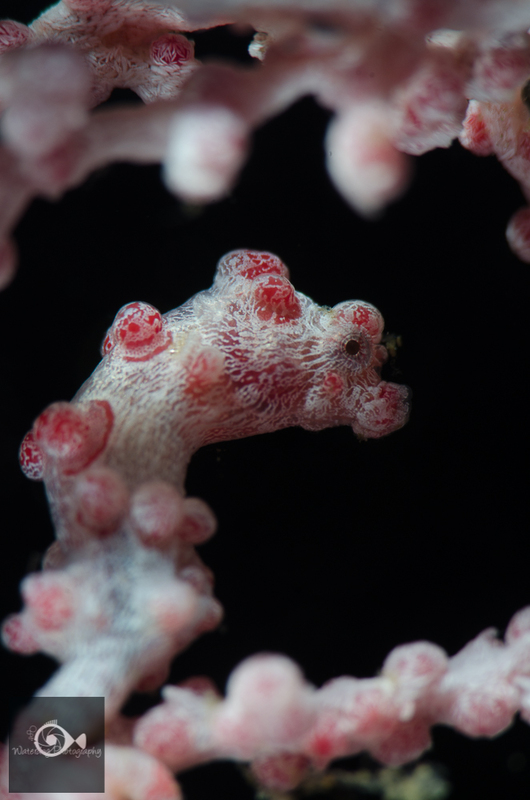 Most marine animals have little or no brains. Instead, they have fight or flight instincts. If you are not perceived as a threat, it only takes a few minutes for the critter to forget about you. As far as it knows, you may have been a feature in it’s environment for months or years. Give your subject time to forget about you, and eventually it may face the camera without being coaxed. 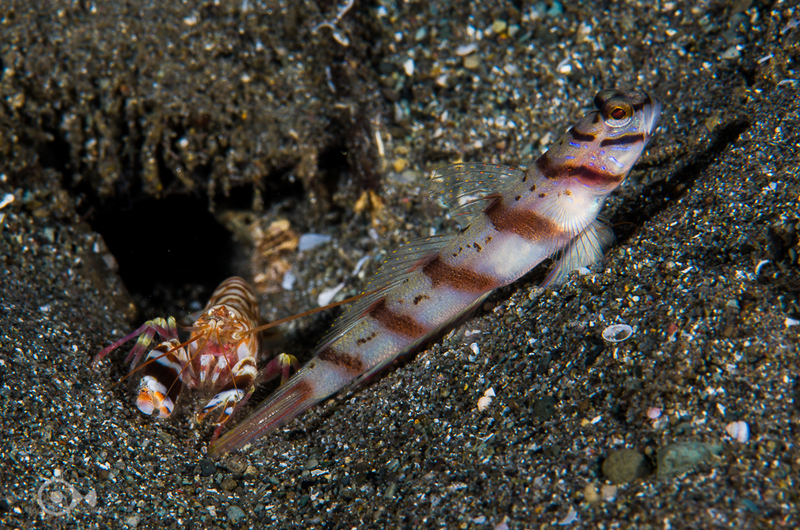 This goby and shrimp took only a few moments to forget I was there, and go about their business of shoveling sand out of their home. #4: Don’t be a Predator! Nothing is more displeasing to an underwater photographer than getting pictures of fish butts. Sometimes we become so excited to get a shot of that rare critter, just to prove we saw it, that we sacrifice good photography. 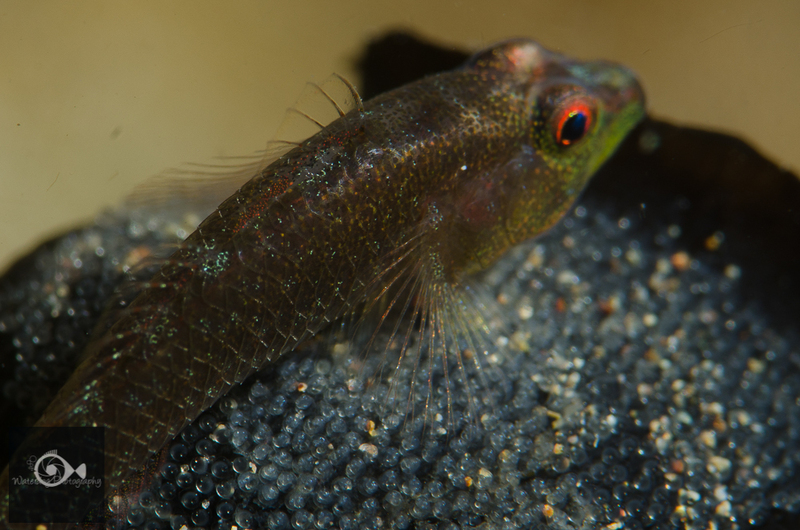 The following image is of a goby on eggs. I really wanted this image, but unfortunately, in my excitement, I was not patient, I did not use red light, and I stalked this poor fish. The result is a fish facing away from the camera, eye blurred, and generally just an uninteresting photograph. Chasing the animals produces the same result. 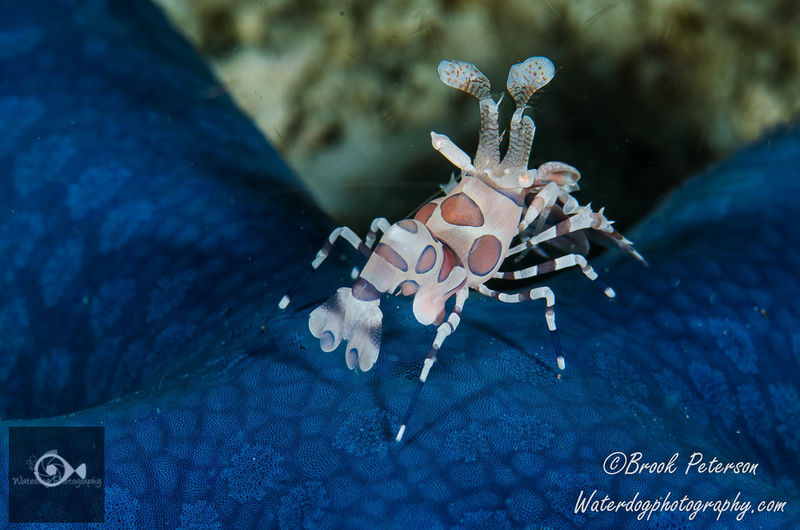 This poor harlequin shrimp felt very vulnerable and could only flee from my big bubble blowing self. So remember, try red light, move your focus light behind the subject, wait for your subject to forget about you, and don’t be a predator. Using these tips will help you get good “face on” shots. Oh, I wish I were a (frog) fish! One fish, two fish, red fish, blue fish. Hog fish, dog fish, meet the Frog fish! I have a good friend who has a fascination with frog fish. And with good reason! 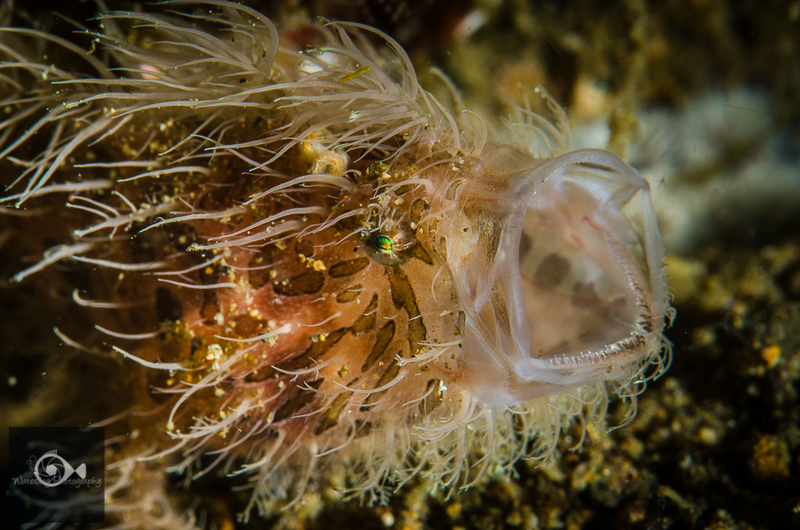 Frog fish are one of the most interesting, and diverse creatures in the ocean. 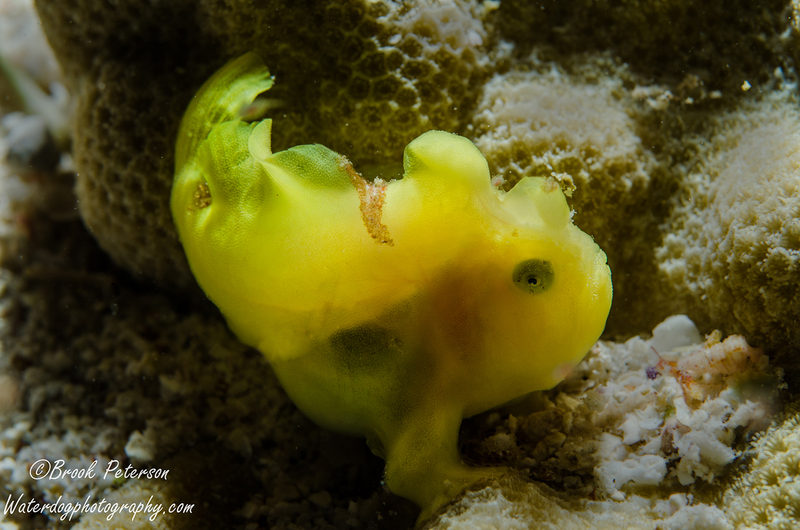 I have learned a few things while visiting my friend at Crystal Blue Resort in Anilao, Philippines, about frog fish. The first and most important thing is that frog fish are cool. 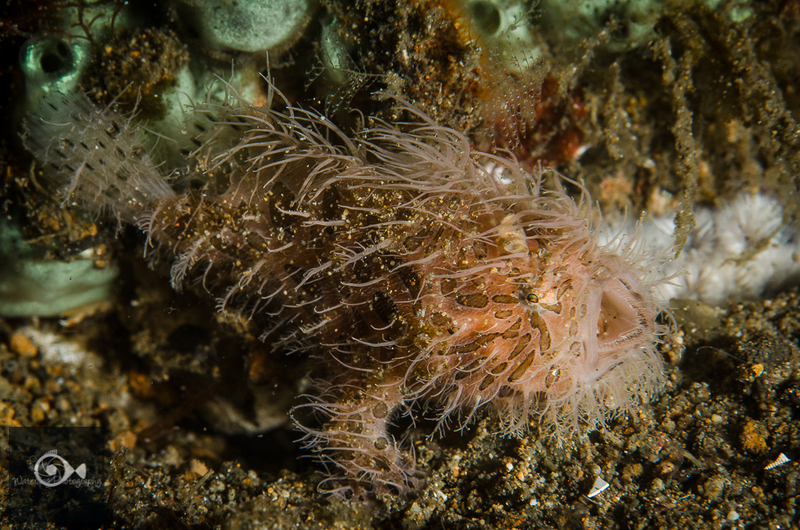 Besides being cryptically well camouflaged, the frog fish comes in sizes from the size of a pea to the size of a basketball. It comes in various colors, textures and patterns too. This was the first frog fish I ever saw. It was in Hawaii, and only the size of my pinky fingernail. Lest this sound like a clothing advertisement, let me tell you about it’s feeding habits. 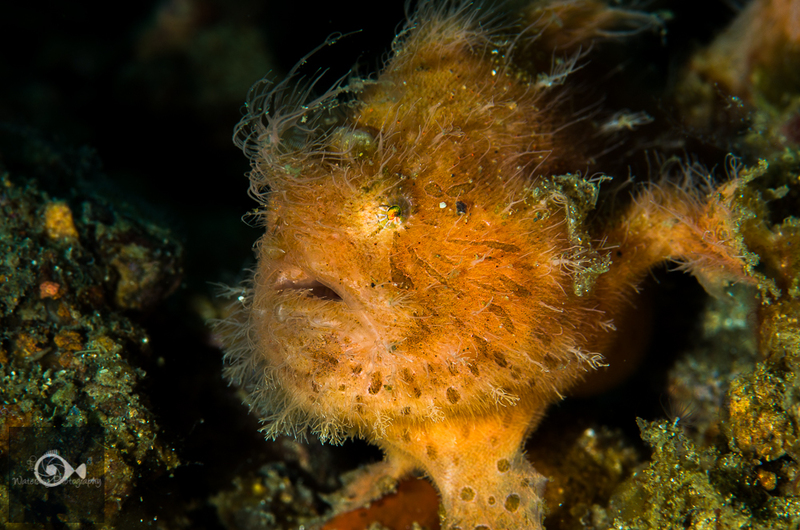 A frogfish has a lure that it waves above it’s head, tempting other fish to come take a bite. 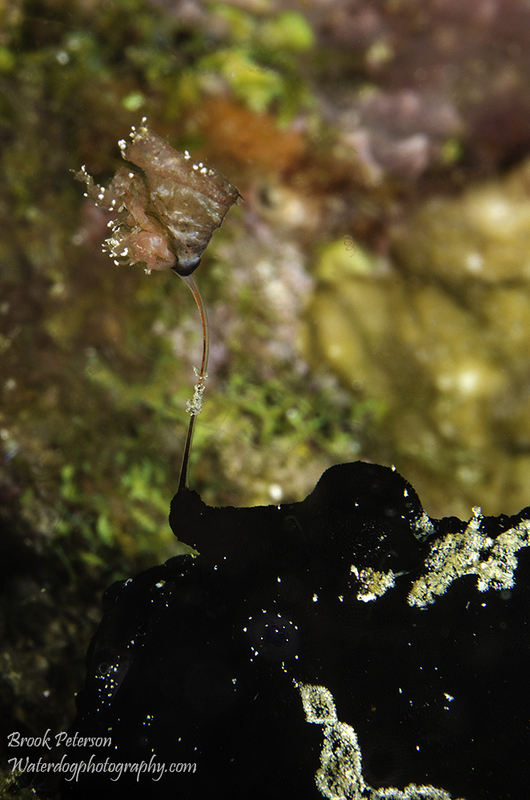 A large black frogfish waving it’s lure above its head. But when that fish get’s close, the frog fish has a lightning quick strike. Check out “One Little Speckled Frog” to Watch a video, here. A frog fish can open it’s mouth wide enough to eat a fish nearly the same size as itself. 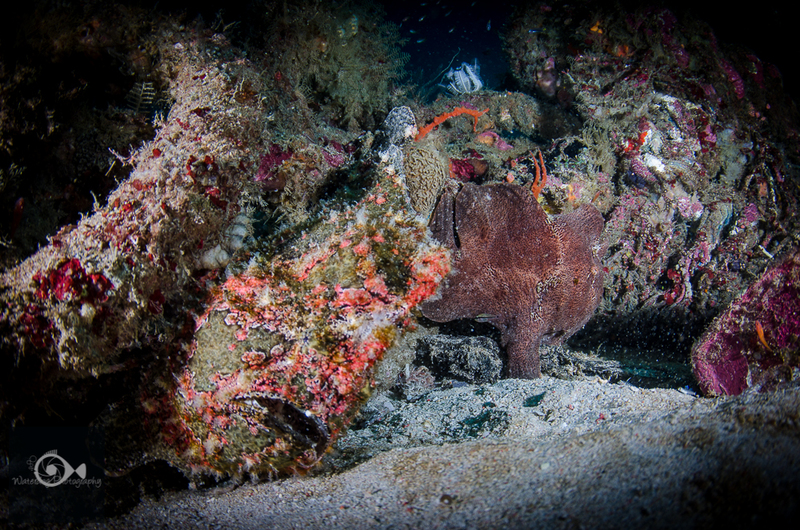 If you watched the video, you can see that the frog fish stalked it’s prey like a cat, walking on its fins. Frog fish don’t swim with their tails and fins like other fish. Instead, they propel themselves through the water by pushing water through their mouths and out a valve behind their elbow-like fins. Most of the time, they stay close to a sponge or rock which looks just like they do, and wait for their prey to come to them. Look closely at the image below. There is a large frog fish front and center. You can see it’s frowning mouth and it is tipping to the right. Another brown frog fish is turned away from the camera behind the first. 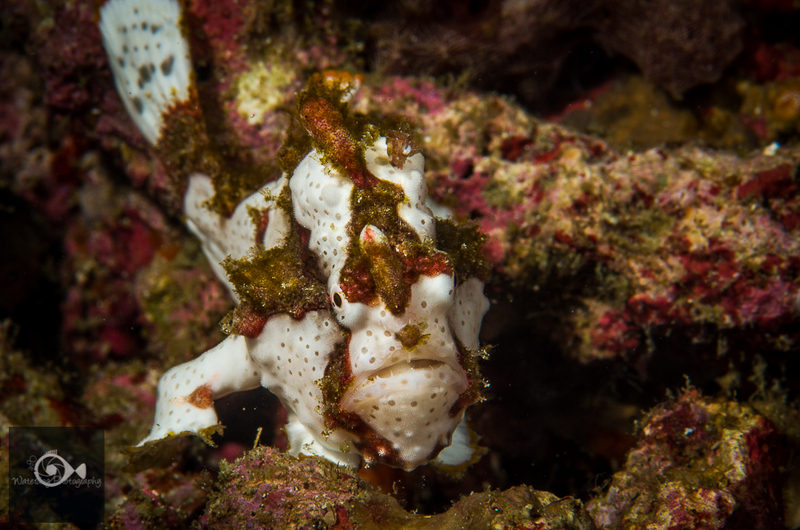 Some frog fish are brightly colored and don’t seem to be camouflaged at all. 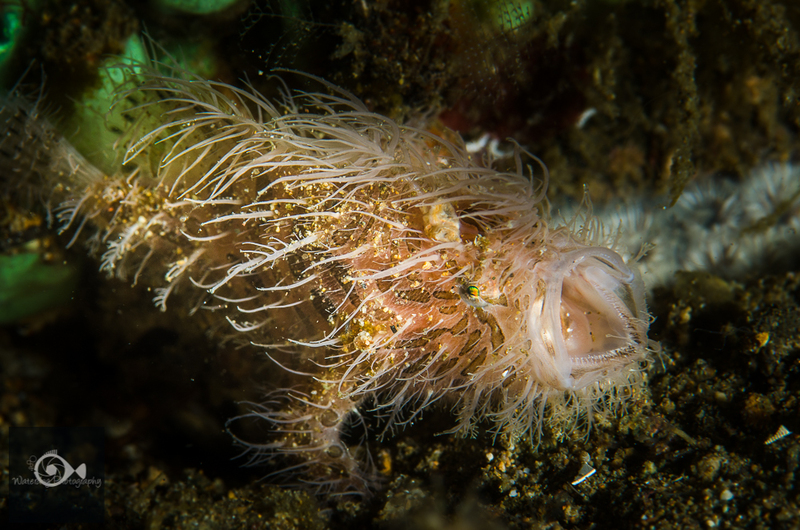 And the hairy frogfish has filaments all over it’s body that resemble the algae in it’s environment. 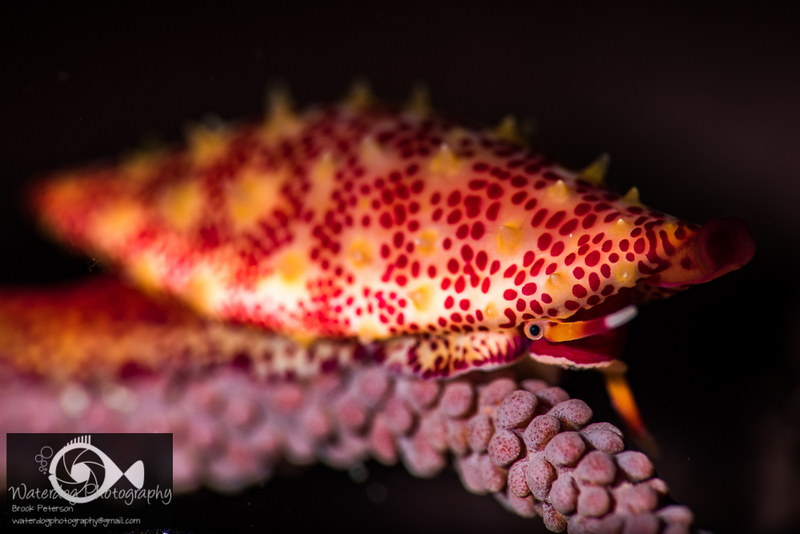 Only a few of these fascinating creatures are represented here, but you can check out the amazing portfolio and blog (click “critterhead) of my friend, Mike Bartick, to see an astonishing variety of frogfish including mating frogfish (click “What’s New”) at Saltwaterphoto.com. 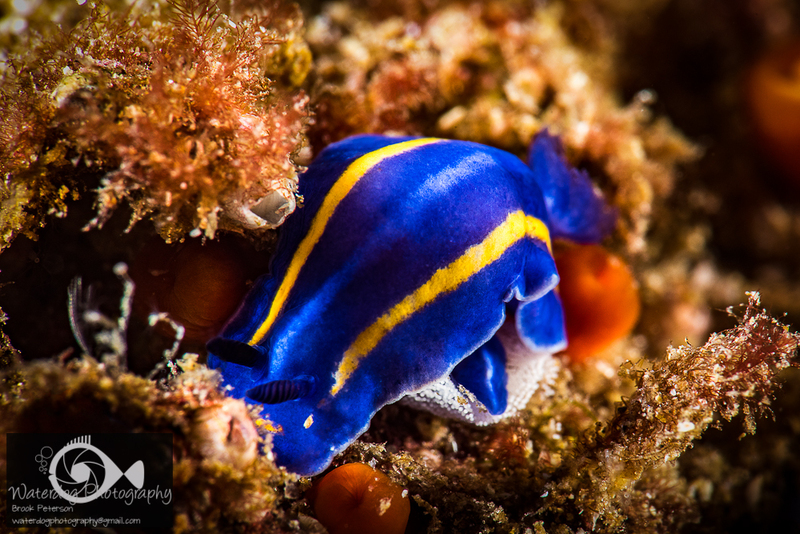 If you are interested in seeing these critters for yourself, my favorite place to see them is at Crystal Blue Resort in Anilao, Philippines.